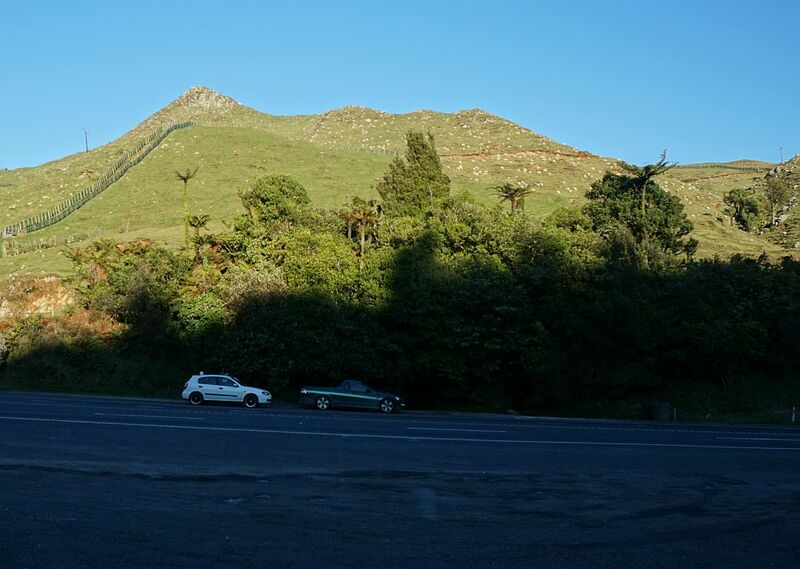 There is a parking area by the northern side of SH29 near the summit. 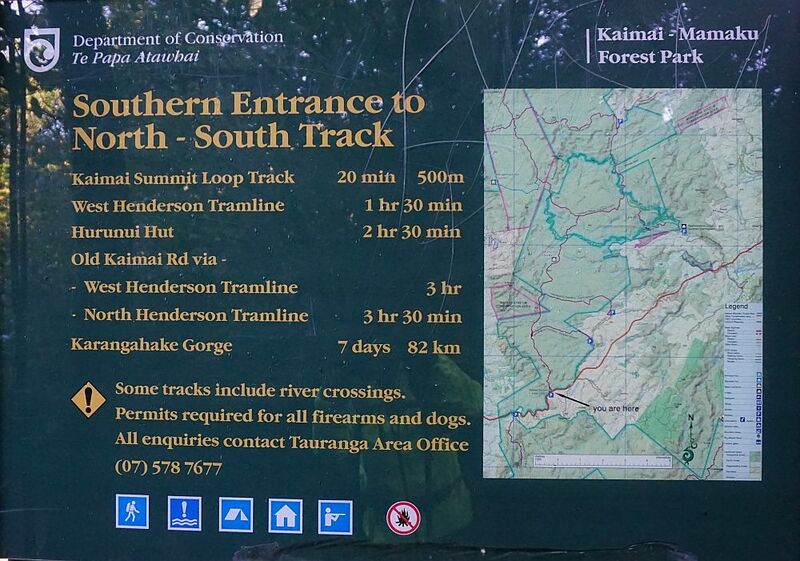 The Summit Loop track forms the first part of the North South track, with both starting at the parking area. Directly across the road from the parking area is a small spring where people often stop and collect drinking water.There are no toilet facilities at the parking area or anywhere along the tracks. 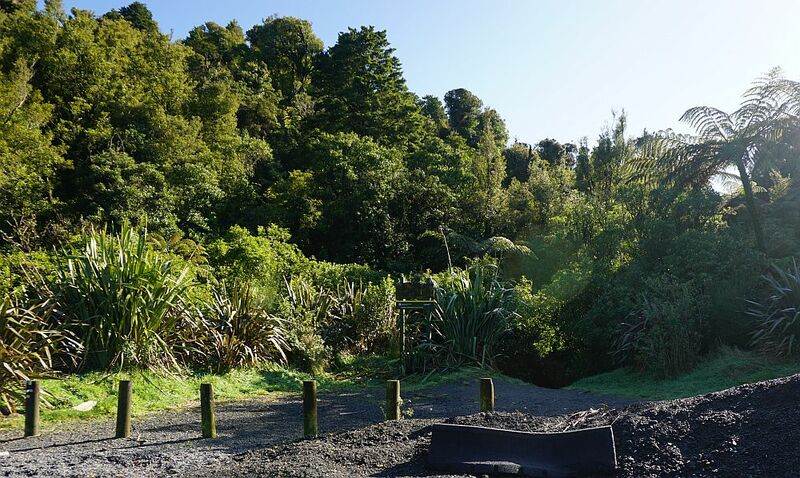 The parking area with the start of the North South Track and the Summit Loop Track. On the other side of SH29 there is a small spring, where people can often be seen filling water bottles with clear spring water. 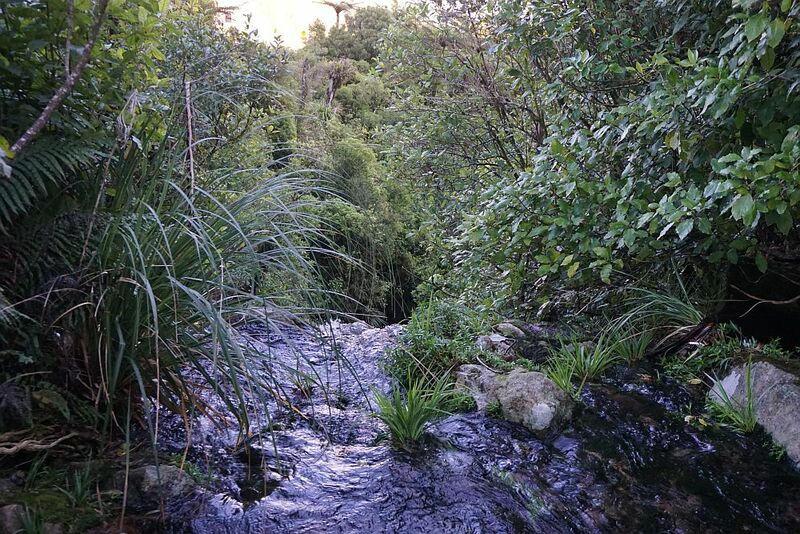 Several small streams converge near the summit, with this one having to be crossed at both ends of the loop track. 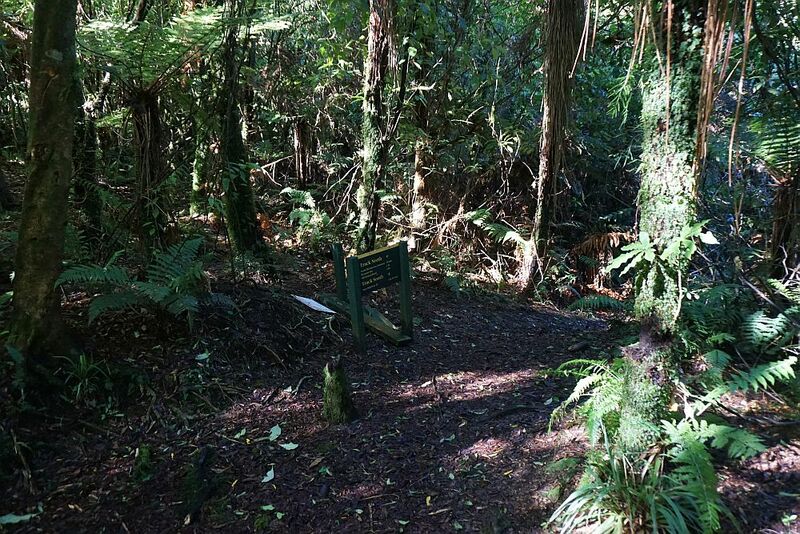 This is at the start of the eastern branch of the loop track. 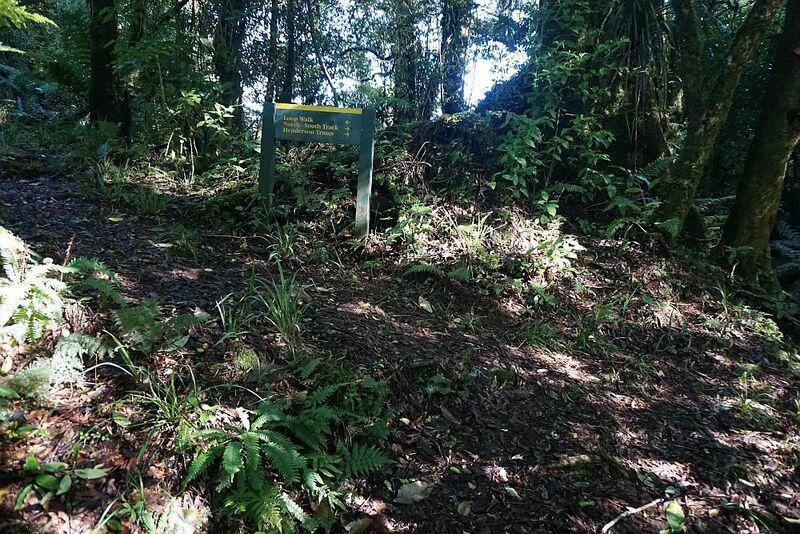 Information panel by the stream crossing and the start of the North South Track. 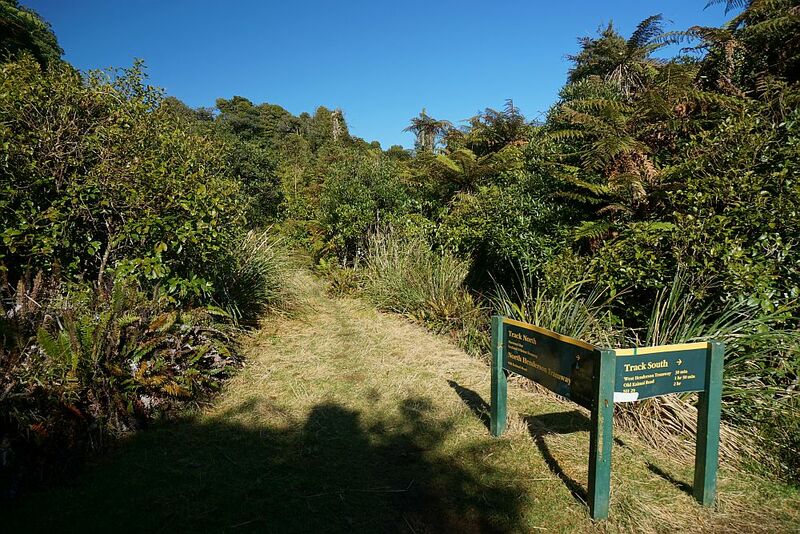 The western branch of the loop track branches off about 250m from the start of the track. 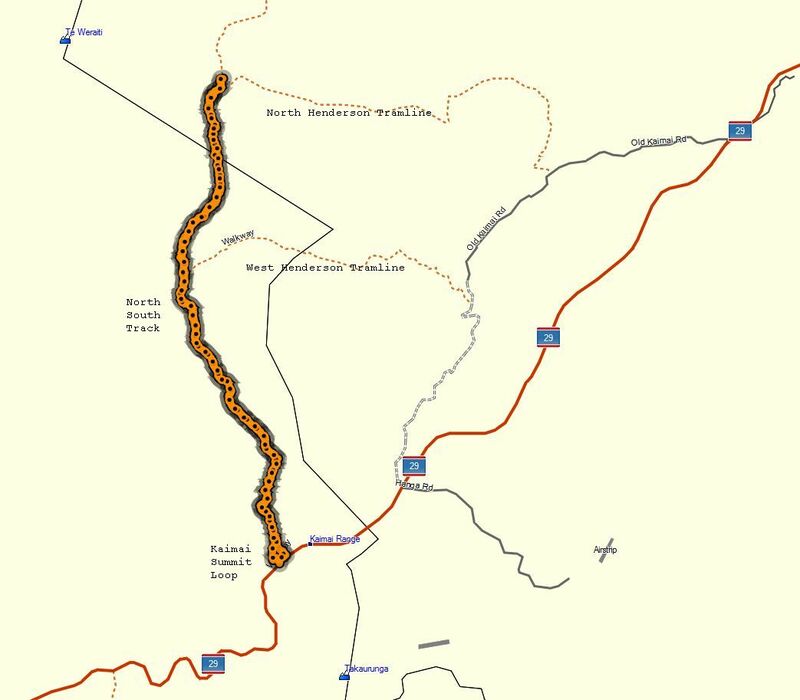 Follow the loop track to return to SH29. 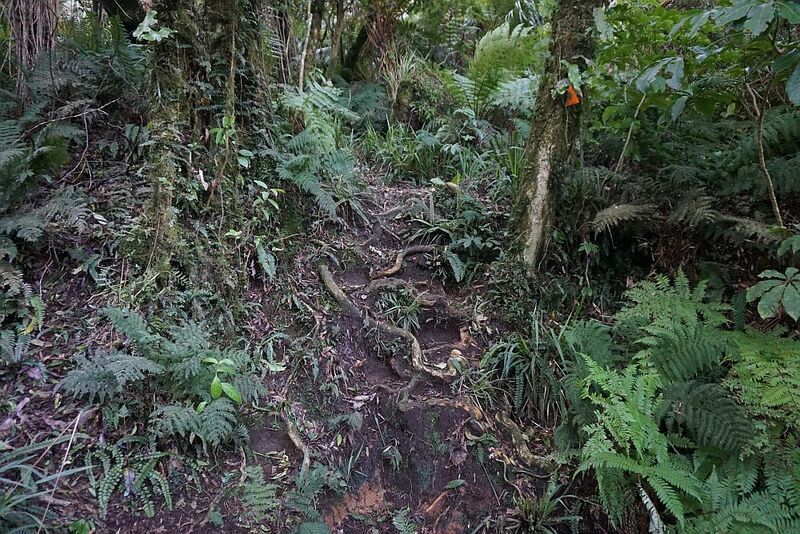 About 1km from SH29 the track climbs quite steeply, with tree roots serving both as steps and as handholds. Elsewhere there are trees that have fallen across the track. Some of them have been cut to reinstate the track. Others have been left and the track has moved to bypass the fallen trees. 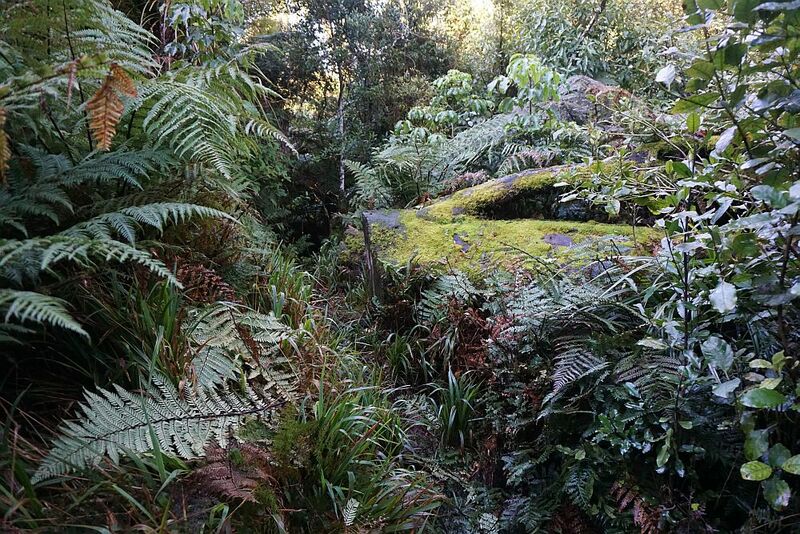 There are only a few locations along the track where surrounding countryside can be seen through the forest vegetation. 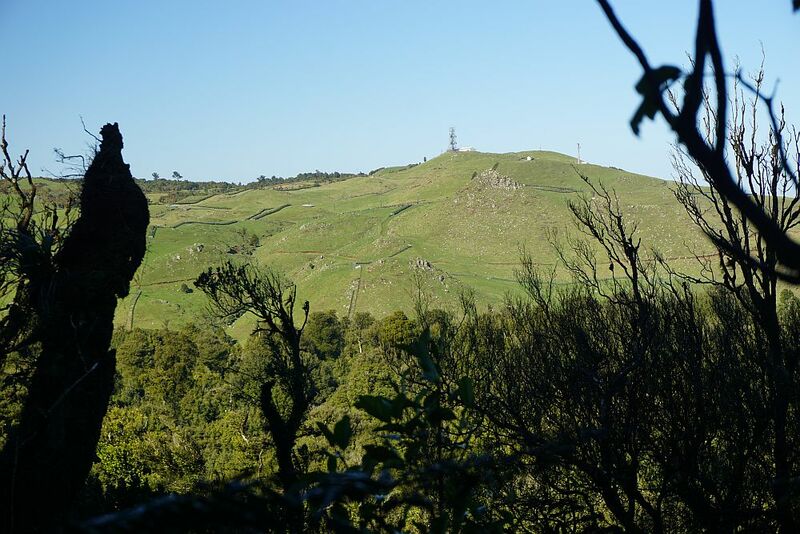 Here looking back across SH29 to the Takaurunga summit with communication towers. 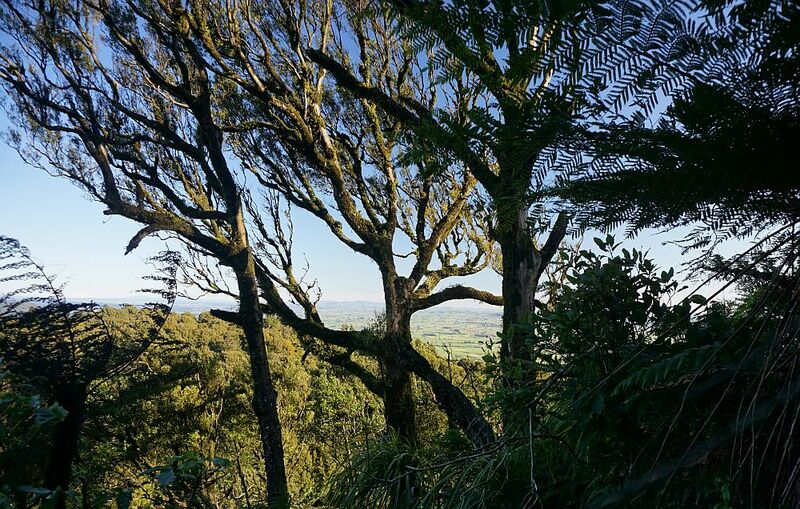 Looking south-west across the Waikato. The Kaimai Range receives a considerable amount of rainfall, and is often covered in low cloud. 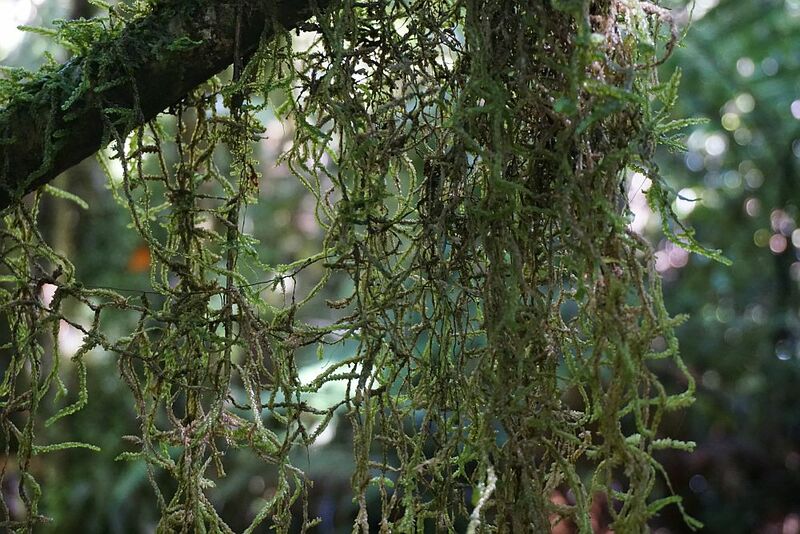 The dampness results in prolific vegetation, including various plants such as ferns, mosses and lichens growing on other plants. 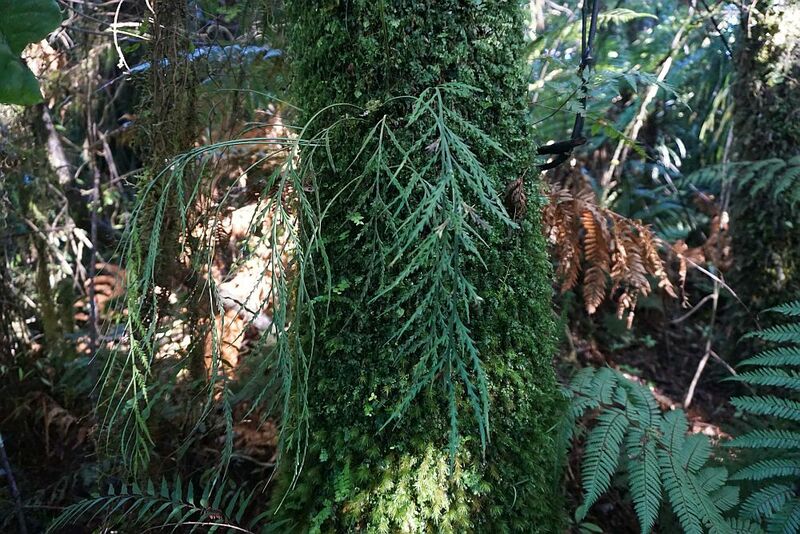 A ponga trunk, normally black, completely covered in vegetation. The intersection of the North South Track and the West Henderson Tramway track. Unfortunately someone or something has damaged the signage. 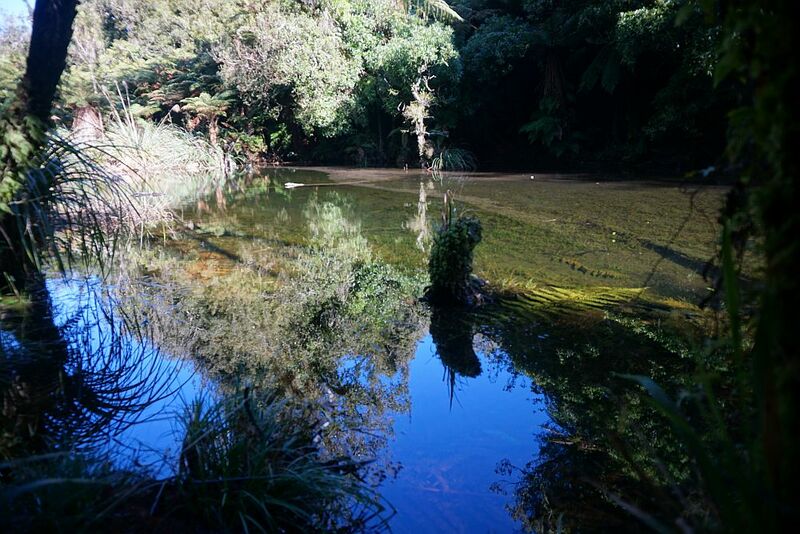 A small, peaceful lake alongside the track between West and North Henderson Tramline tracks. 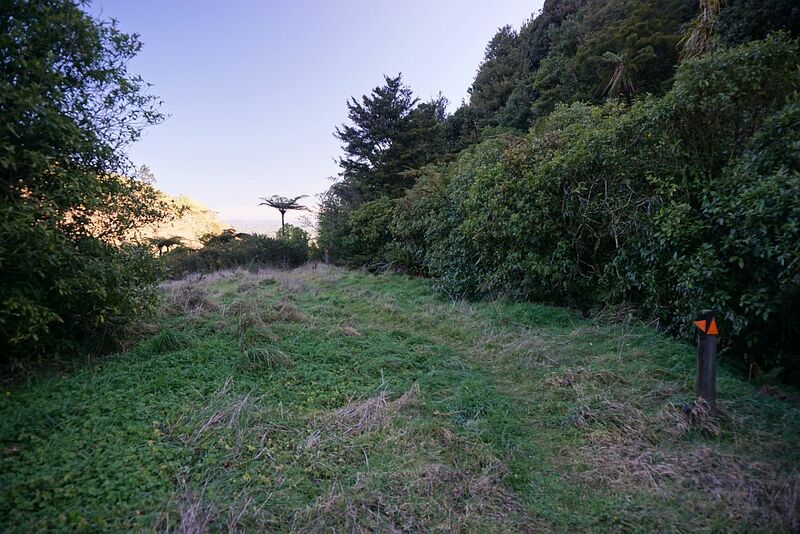 Between the two Tramline tracks the North South Track follows what could have been another tramline, as the track is fairly straight and has not steep inclines. So during winter months of after rainfall the track can be muddy and slippery. 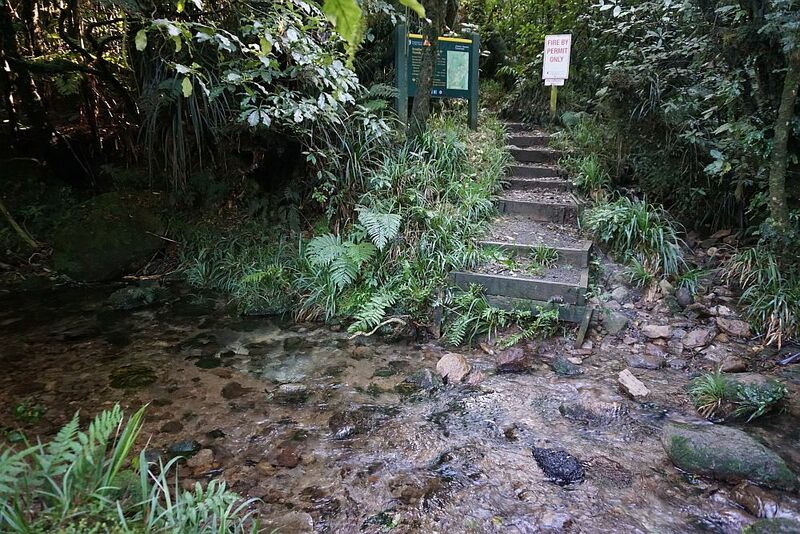 There are also a few stream crossings, most of which can easily be crossed without getting wet feet. However a couple of them can be more difficult to cross. The intersection of the North South Track and the North Henderson Tramline Track. 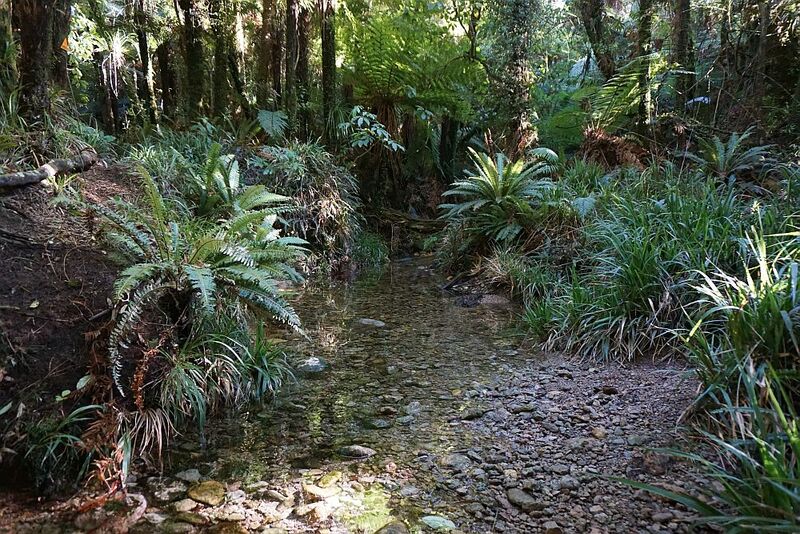 The western branch of the Summit Loop Track crosses a stream close by SH29. 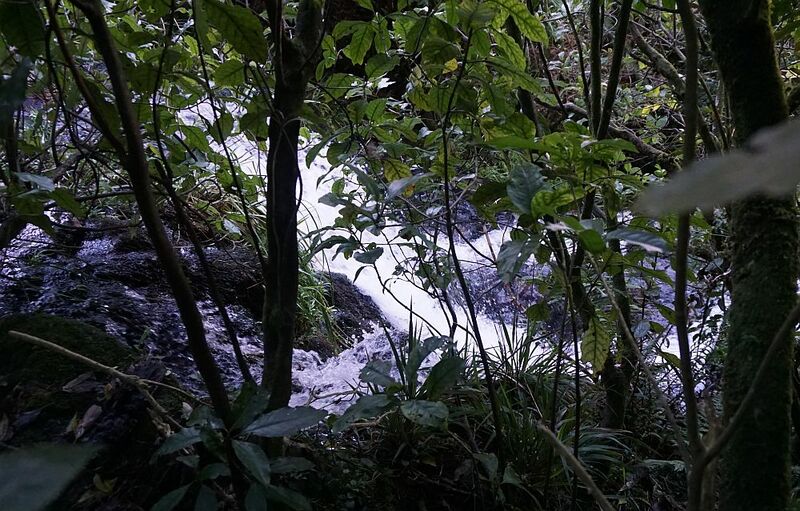 The stream drops through several cascades next to the track. Unfortunately there are no lookouts where the waterfalls are clearly visible. The end (or start) of the loop track western branch, next to SH29 and the parking area. The total distance walked was about 12 km (6 km each way), with a total time of 4 hours 30 minutes, including a short lunch break. The North South Track between the two tramlines is one of the few where the walking time was considerably longer than the times posted by DoC. The posted time is 30 minutes, but it took close to 50 minutes going north, and at a brisk pace 40 minutes heading south. Elevation at the parking area is about 474 meters above sea level, and the highest point on the track is close to 600m. 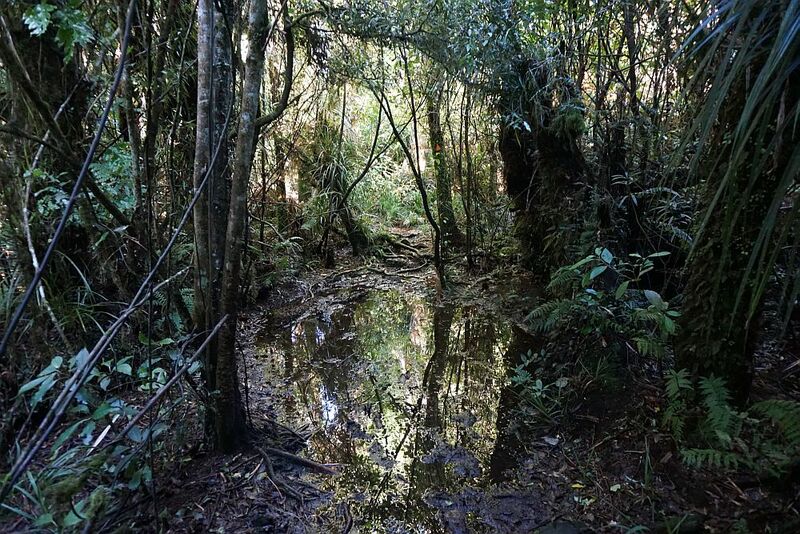 The GPS is not very accurate under dense tree cover, so distances and elevations are not entirely certain. The loop track is about 700m long and took close to 20 minutes. The GPS track log shows the tracks walked. 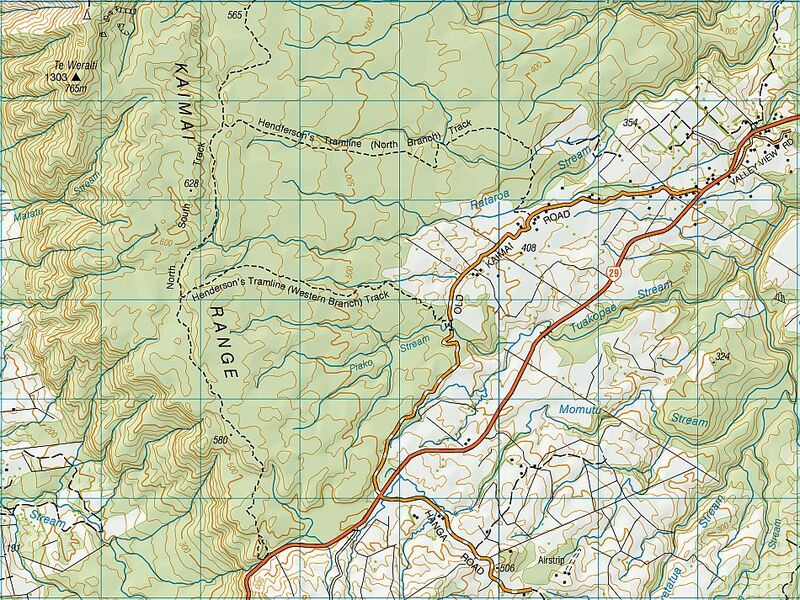 A topographic map covering the area and the tracks. The track was walked on July 21, 2015. The North South Track between the two Henderson tramlines was also walked on August 16, 2014.